A badly corroded box found in a 17th century tomb has been virtually opened by powerful synchrotron X-ray imagining and its contents revealed in exceptional high resolution. The box and its contents are not so portentous, archaeologically speaking, but the phenomenal quality of the imaging opens up a whole new world of possibilities. 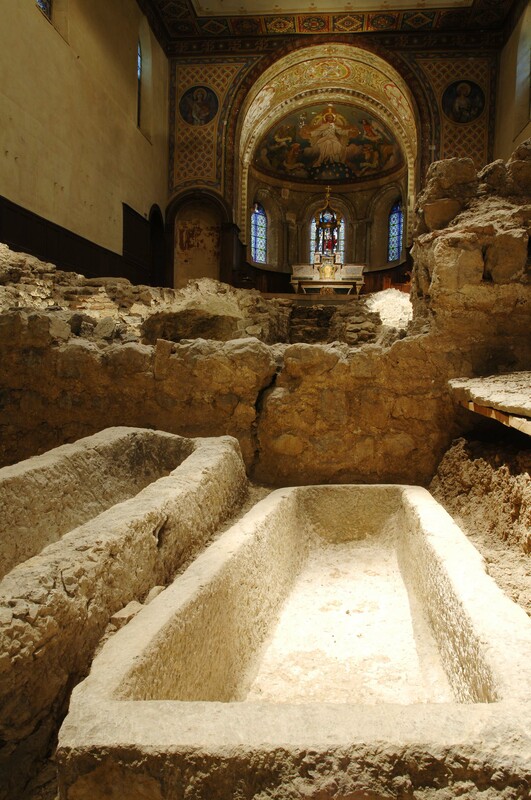 The metal box was found in one of more than 1,500 tombs unearthed under the old Saint-Laurent church which is now the Grenoble Archaeological Museum. The site has been in use since the 4th century when it was a cemetery outside the ancient city. Starting with a cruciform church in the 6th century, buildings were constructed on top of the remains of earlier buildings in four known stages. The current Saint-Laurent building is a 12th century Romanesque church that was deconsecrated in 1986 and converted into the museum. The crypt from the 6th century church was discovered in the basement of the Romanesque church in 1803 and subsequent excavations peeled back layers to reveal burials from the 4th through the 18th century. This one church and its environs encompass a complete history of Christian burials over an astonishing 16 centuries. Modern archaeologists have been exploring the burials for the past 20 years, taking the unique opportunity to study the evolution of Christian funerary traditions spanning 1600 years. More than 2,000 artifacts have been discovered in the tombs, many of which are on display in the museum which beautifully weaves the open excavated crypts into exhibition space. The box was found buried next to a body in a group of 195 graves from the 17th centuries. It’s a tiny piece — just 4 centimeters (an inch and a half) in diameter — and is so fragile conservators decided to restore it only to the point of stopping the oxidation process that was eating away its metal. 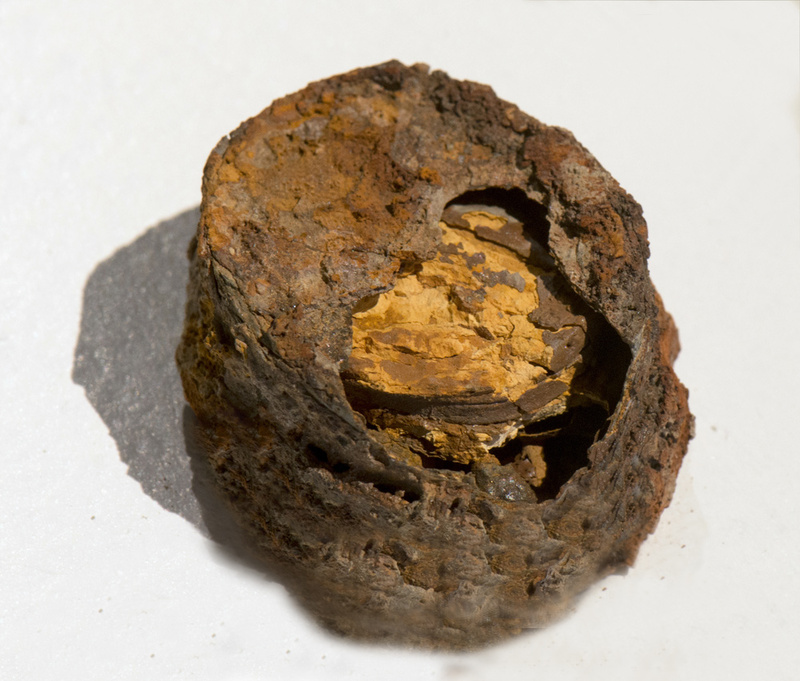 Because corrosion had worn a hole in the lid, they could see that there were three round coin-like objects inside, but couldn’t make out any further details. The museum reached out to the European Synchrotron Radiation Facility (ESRF) team to scan the box using synchrotron X-ray phase contrast micro-tomography. This technique, which can be likened to a highly powerful medical scanner, is capable of producing high resolution 3D images of the inside of a sample in a non-destructive manner. “It was only supposed to be a small feasibility study to produce an image for an exhibition. However, the results were so astounding that it turned into a full scale research project”, says Paul Tafforeau who carried out the experiments and produced the 3D images of the box. The imaging is far better than anything we can see with our puny human eyeballs so markedly inferior to those of any cephalopod. We now know that there are two identical medals sandwiching a different one between them. The middle medal, which has the most surviving detail, depicts Christ on the cross with two figures — probably Mary Magdalene and the Virgin Mary — standing on either side. The other side of the medal shows Christ wearing the crown of thorns, rising from the tomb with one leg out of the coffin and holding the standard of the Resurrection and Victory. The other two medals were both more damaged, but fortunately in different places so it was possible to use the image of one medal to fill in the blanks on the other. One side shows the baptism of Christ and bears an inscription from John 1:14 VERBUM CARO, FACTUM EST (“And the word was made flesh”). The other side is a Nativity scene, with the Magi bringing gifts to the baby Jesus on Mary’s lap. The inscription is a verse recited during the Stations of the Cross: ADORAMUS TE, CHRISTE ET BENEDICIMUS TIBI (“We adore Thee, O Christ, and we bless Thee”). This entry was posted on Friday, November 6th, 2015 at 11:54 PM	and is filed under Modern(ish). You can follow any responses to this entry through the RSS 2.0 feed. You can skip to the end and leave a response. Pinging is currently not allowed. You are either out there in the mountains with no church in sight, or alternatively surrounded by inner-city heretics. This box, however, is a mobile -by then state of the art- iPray device from the local ‘taberna malorum’ with ChristOS installed on it. The two pearls are the remains of an otherwise wooden rosary and work in combination with the three medals as follows: Depending on the ecclesiastical season, two of them are stored in the metal box itself and the third one in the open lid while the rosary is used for prayer. I wonder if this can be used on the scrolls from Herculaneum? Whether or no, it’s a fantastic breakthrough. The possibilities for this technology in Egyptology alone are mind-boggling.